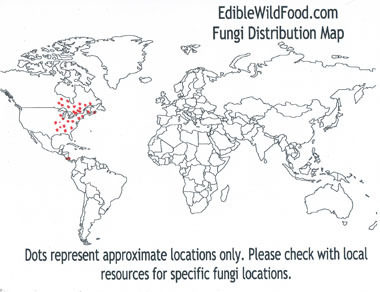 Overview: Hericium americanum (Fam. Hericiaceae ) is white when fresh and yellows with age. It has long spines and a branched fruiting body. The fungus is 15-30cm (6-12”) across. It is a tightly branched structure which develops from a rooted base. 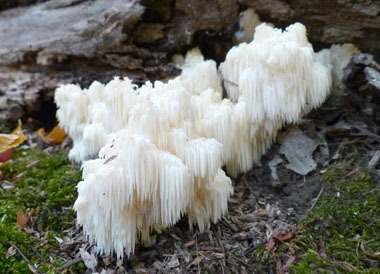 When young, before the branches have developed, it might be confused with Hericium erinaceus (which is also edible). 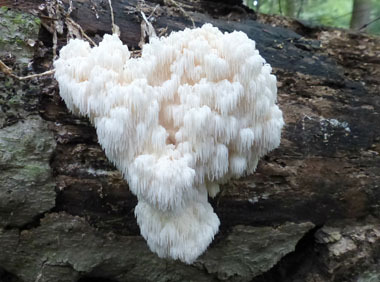 Distinguishing Features: This species of Hericium is easy to identify; it is the only species that develops a single clump of dangling spines, rather than hanging its spines from a branched structure. Additional identifying features include that it typically appears on the wounds of living or very recently cut hardwoods, and that its spines are generally more than 1 cm in length. Height: The spines measure .5 -4cm (1/4 - 1-1/2”) long and hang from the branches in clusters or rows. In total it can measure 15-30 cm ( 6 – 12”) across. Habitat: This saprobic fungi fruits on dead hardwood or on living trees that have been injured; though it has been documented on conifers. It is solitary or clustered. Season: Late August to November. Edibility: Edible when young – be sure it is white. Mild nutty taste; cook before eating.